Could this beast be brought back to life? Could dinosaurs really walk the earth again? If we believe our saucer-wide eyes in cinema, then (thanks to movie magic), yes. But is there any truth in the fantasies we watch on the silver screen? In a new regular series, we track down experts in various fields to ask them just how probable the outrageous scenarios we see in movies really are. This time we want to know if we could really expect T-Rex and his mates co-inhabiting with us if we find an amber-trapped mozzie like the scientists in the Jurassic franchise? 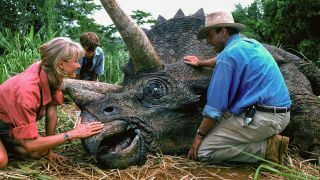 In Jurassic Park, dino DNA is extracted from a mosquito and used to create dinosaurs. Science fiction or fact? "Mosquitos in amber are pretty rare, though other blood-sucking animals such as ticks have been found. But the amber mine in /Jurassic Park/ is set in the Dominican where that amber is between 40–20 million years old – long after dinosaurs like the T. rex, Brachiosaurus and Velociraptor were alive. Is it possible to extract DNA from anything as old as a mosquito in amber? Simply, no. Although fossilised ‘blood’ has been found in several specimens, it is still subject to the same process of fossilisation where the original structures are completely replaced by minerals – thus, DNA etc does not survive. The only place where this might be possible is with Ice Age animals (e.g. mammoths), but even then the DNA has still degraded. However, dinosaurs ARE still alive in the form of birds. So this concept of ‘dinosaurs are extinct’ should, well, become extinct itself! For some time, there have been plans to use mammoth DNA to impregnate a living elephant and ‘bring the mammoth back’ – as a hybrid. Not only is this morally wrong, it costs huge sums of money – money that would be far better spent protecting endangered animals than playing science fiction." This feature appears monthly in our sister publication Total Film magazine. Pick up a copy now or save up to 58% on a print and digital subscription so you never miss an issue.